Horses are dangerous creatures, apparently more so than snakes, spiders, sharks and several Pokémon. Without doubt the most evil are the panto variety; approach one of them at your peril. 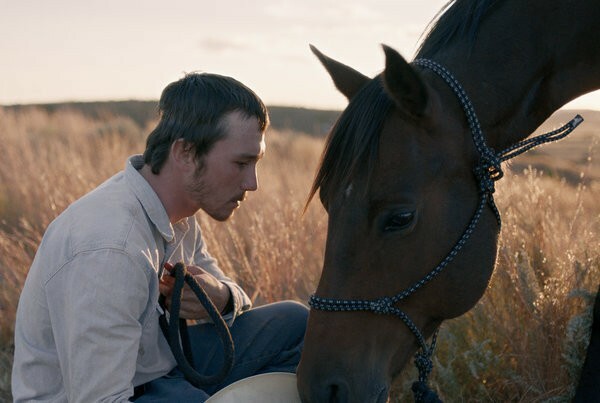 Luckily for us all, those kind don’t feature in Chloé Zhao’s second full length feature, which focuses on those equine creatures that take part in that fading American institution, the rodeo. I know it's only been two weeks, but would you do me the honour of marrying me? Everyone who takes part in a rodeo knows the possible consequences, but that doesn’t make it any easier when a horse throws you and bones crunch. That’s exactly what happened to young Brady Jandreau (Brady Blackburn), when he fell of his ride and injured his head. Even though he managed to walk away – unlike his best friend Lane (Lane Scott), who suffered severe brain damage - a metal plate in his head is a constant reminder that he shouldn’t do it again. But when all you know – and possibly more importantly, when all your friends and family know – is the rodeo world, it’s difficult to turn your back on it all. He just couldn't hide the disappointment of not getting tickets for Justin Timberlake. There’s a lo-fi feel to Zhao’s film that is difficult to ignore. Everything from the pure regional dialogue to the ‘natural’ performances, make the film have one cowboy boot in fiction and the other in reality. It’s a refreshing effect that has a rhythm all of its own, that takes a beat or two to appreciate, but once you do, you ride with it. It transpires that this result was reached by Zhao using non-professionals for the major roles; she even takes it further by having Blackburn’s real father and sister play his fictional family counterparts. Scott also plays a version of himself, although in real life he sustained his injuries from a car accident. Considering their lack of experience, the entire cast do a truly remarkable job in helping to deliver Zhao’s impressive vision. So much so that it wouldn’t be a surprise if the horses were winging it too. A special mention should go to young Blackburn though, who is captivating throughout, and digs surprisingly deep emotionally for an amateur. It may move along at a pace more akin to a trot than a gallop, but it only adds to the film’s unique charm. The Rider is a title that you may well go into with low expectations, only to be blown away by how genuinely touching and tender an experience it is.